Isam B, Waqas and Lenny are the year's recipients of Odder H�jskoles Elevforening's cultural award. Outlandish Will receive on November 11th Odder H�jskoles Elevforenings (OHE) cultural award, The Turn gold Grundtvig. The price is distributed for the 10. time, and Outlandish comes at distinguished company, when the earlier award winners include so marked names as Steffen Brandt, Lise N�rgaard and Benny Andersen. - We think, Outlandish is worthy recipients of the price of more reasons; They stand at their roots, but leave space for disparity and inspiration from the outside. They have brought the Danish song treasury not least to themselves, for instance along their fantastic interpretation of "Man Binder Os P� Mund Og H�nd" (by Poul Henningsen and Kai Normann Andersen, ed.). Outlandish has shown how you can modernize without loosing the touch to traditions and history. The award show will take place at an open arrangement at Odder H�jskole on Tuesday November 11th at school lecture hall at 19.30 o'clock. All is welcome, and after the actual award show the school is a host for a light treat. Hiphop/soul/pop/world-with-more-Gruppen Outlandish consist of Isam Bachiri, Lenny Martinez and Waqas Qadri with roots in respectively Morocco, Honduras and Pakistan. They have temporarily published three CDs and a number of singles with great success. The group made its d�but in 2000 with the very praised album "Outland's Official", which gave them the hit "Walou for instance". In 2002 sent out those "Bread And Barrels Of Waters" which gave them hits like "Guantanamo" and "Aisha". 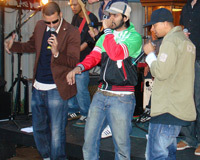 The latter, a cover version of Khaleds, became in 2003 one great hit over large parts of Europe. In 2005 came their temporarily last album, "Closer Than Veins", which again gave hits like "Look Into My Eyes" and "I Only Ask Of God". Outlandish has been praised for their engaged subtitles and compound sounds, which fetch inspiration from all the world's musical styles. In 2007 Isam B published the Danish-speaking solo-album "Institution", which also became a great success and downplayed the hiphop inspiration in favour of a more singer-songwriter-oriented expression. On November 10th Waqa's will publish one's also Danish-speaking solo-d�but "Eco logic", which is inspired by both hiphops and Bollywood. Outlandish consequently is far from dissolved, but is at full swing with working on their fourth album. Odder H�jskoles Elevforening has distributed one's cultural award nine times. The earlier award winners include people like Thomas Buttensch�n, Steffen Brandt, Lise N�rgaard, Benny Andersen and Johannes M�llehave. Prisen's instrument of foundation suggests: The price is a folk high school cultural award, which is given people, organizations or societies, who either directly have yielded an effort for the folk high school tank and the folk high school movement's continued existence in the Danish society, or have contributed to the popular information tradition and culture, the Danish folk high school originates in. The price is on 10.000 crowns and a work of art.